Zippo Blu Is In Stock! Since 1932, Zippo has made the world's quintessential windproof lighter. With its timeless design, its distinctive click and its unmatched dependability, a Zippo lighter quickly becomes a prized posession. Now, the Zippo experience can be enjoyed in a new way with the Zippo BLU™ lighter. It's the next step in the evolution of the perfect flame. The Zippo BLU™ lighter features the reliable flint-wheel ignition that is a Zippo trademark. It is the world's first butane gas lighter to incorporate this ignition system. Zippo is proud to make the Zippo BLU™ lighter in the USA. Other signature Zippo product features include rugged metal construction, hinged lid, one-hand operation and the iconic sound of the Zippo click. Of course, each Zippo BLU™ lighter is stamped with a date code and guaranteed for life. It is easy to see that the Zippo BLU™ lighter has a distinct profile. Each unit is slightly taller than the windproof lighter and is enhanced by a smooth, comfortable contour with a lid line in the shape of a soft curve. Another unique design element is the signature "Z" pattern of the chimney. Elegant, pocket-friendly designs are also hallmarks of the new Zippo BLU™ lighter. The Zippo BLU™ lighter is built with a patented two-stage burner technology that delivers a consistent, clean-burning hot blue flame. Featuring a large fuel tank, the Zippo BLU™ lighter uses butane gas, while the conventional Zippo windproof lighter is filled with liquid lighter fluid. As is the Zippo tradition, both lighters are shipped from the factory without fuel. 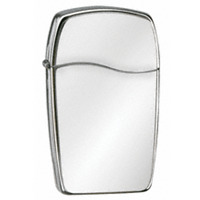 Place an order for a Zippo BLU™ lighter today.